NASA Visible Earth: Drought Recorded Across Half of the U.S.
Map courtesy of the U.S. Drought Monitor. Caption by Mike Carlowicz. 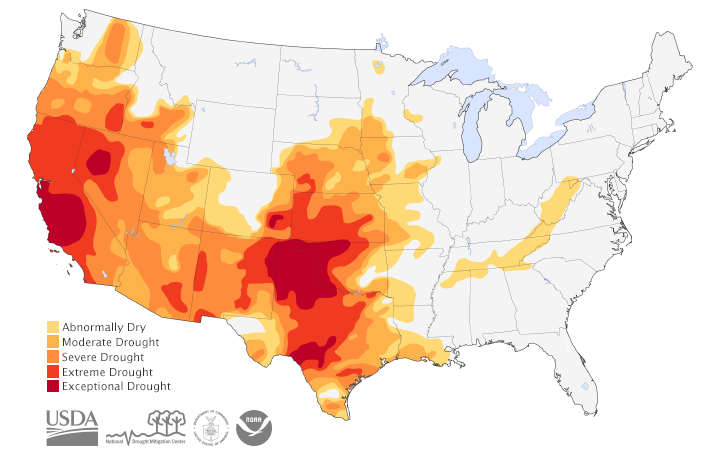 As of May 6, 2014, half of the United States was experiencing some level of drought. Nearly 15 percent of the nation was gripped by extreme to exceptional drought. For the Plains and the Southwest, it’s a pattern that has been persistent for much of the past several years. Kansas continues to set the edge of the intense drought that seems to be waking up and pushing rapidly north along with warmer temperatures...Soil moisture and groundwater levels are hurting well in front of the peak demand season, as the cumulative impacts of such an intense multi-year drought are already glaringly evident...The story is even bleaker in the southern Plains, where the heat and drought are even more pronounced and entrenched across western Oklahoma and much of Texas as well...Streamflow and groundwater levels are hurting, given the long duration and sustained intensity of this drought, which is now going on close to four years. The entire state of California is in some level of drought, much of it extreme to exceptional. Snowpack is 50 percent of normal in many locations in the West, and Svoboda noted that a lot of snow has completely melted before it normally would. Drought has had a serious impact on fruit and vegetable agriculture in California, and news reports sounded the alarm for grains and livestock in the Plains and South Central West. At least 54 percent of the nation’s wheat crop is affected by some level of drought, as is 30 percent of corn, and 48 percent of cattle. Associated Press, via The Brownsville Herald (2014, May 12) Arizona town near Grand Canyon runs low on water. Accessed May 12, 2014. Farmers Weekly (2014, May 12) U.S. drought could halve wheat harvest in Oklahoma. Accessed May 12, 2014. 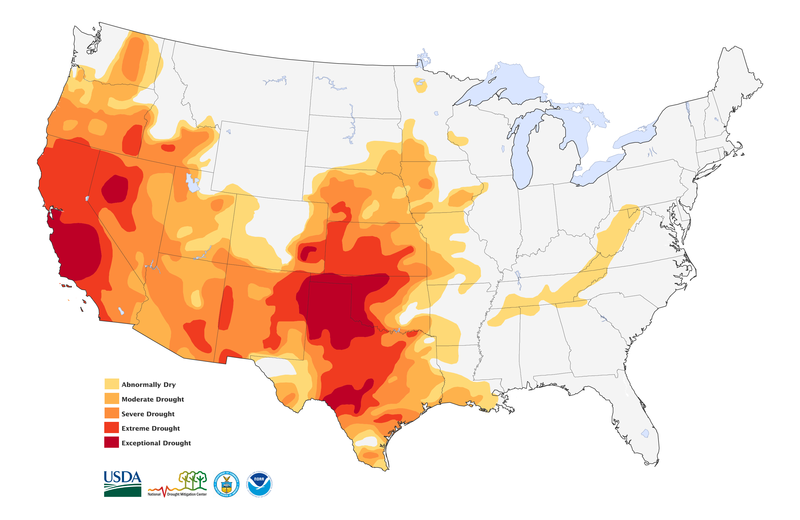 U.S. Drought Portal (2014, May 6) Weekly Drought Update. Accessed May 12, 2014. U.S. National Drought Monitor (2014, May 8) National Drought Summary for May 6, 2014. Accessed May 12, 2014. Weather Underground (2014, May 7) Weather Extremes: Record Heat, Drought Continues in Southern Plains. Accessed May 12, 2014.